Designed to allow liquid to flow from separator into collection reservoir. Lines are sized for separator conditions. Isolation valves are used to shut off flow from separator to collection reservoir or close when pigging. Extended valve stem to surface to allow for shut off and reservoir isolation. Has a slotted inner section (to match line pipe) and a larger outer chamber that covers the slotted line pipe section. 1” to 60” pipeline designed to match pipeline size and grade. Beveled for inline welding or flanged. 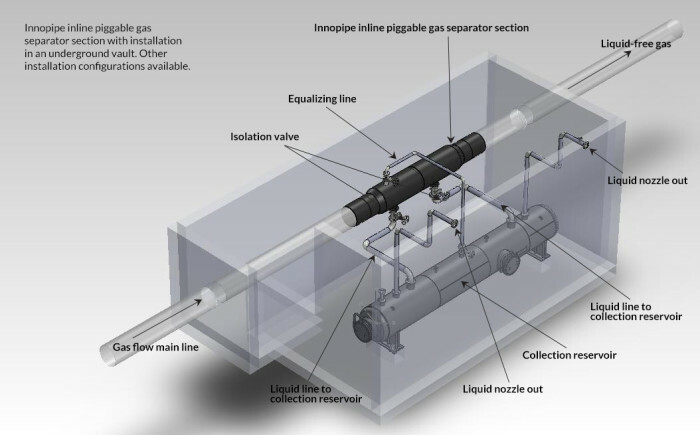 The Innopipe inline gas separator and piggable drip system is versatile and flexible and can be designed to meet custom specifications. The system can be used for sweet or sour gas and adjusted to meet required flow rates. It can be installed in harsh, cold climates without compromising effectiveness. Options for installation include buried below grade, above ground or installed in vaults or cassions. The system meets all industry design standards.